Greetings, hoppers! 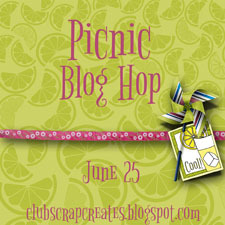 Welcome to my little part of the Club Scrap blog hop featuring the fun and colorful Picnic collection. If you got here from Janet's blog, you're in the right spot. To see the entire list of participants go to Club Scrap Creates. As I said, my part of the hop is quite small this time. As much as I love this new kit, I haven't had time to create anything with it. I bowed out of the May blog hop because of time constraints, but I was determined to have a part this month! I created this fun card that would be great for a birthday. Speaking of birthdays, today is my youngest daughter's special day, though I dare not give this card to her, as it has PINK on it! Not sure what she has against the color, but she likes every color except that one. I absolutely love dies. 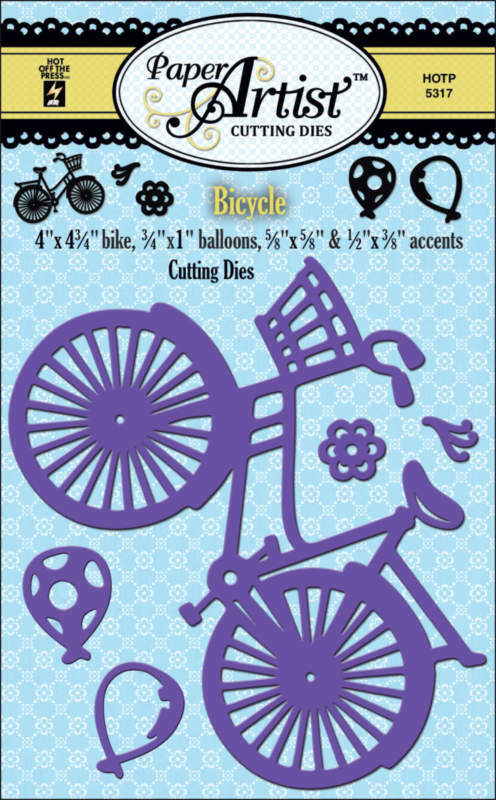 I recently started getting dies monthly from Hot off the Press, and a month or two ago I received this fun bicycle die set. It allowed me to create this fun, summery card with some Picnic papers. It's pretty straightforward--just the background might need some explanation. I used Memories Mists to create the sky and grass, cutting out clouds from Post-It notes to adhere to the white Picnic cardstock before spraying. Green grass, blue sky, a bike, and some balloons--looks like summer to me! That's it for me this month. 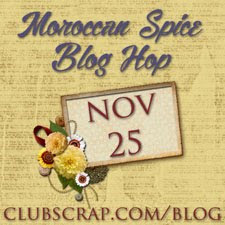 The next stop on the hop is Annette's blog, Digital Musings by AnnetteD. Can't wait to see what digital creations she has developed this month. Lisa this is such a delightful example of using dies. Now I will have to get some of mine out and use them. thanks for the inspiration. Fun card, Lisa! I love the little set of balloons attached to the bike (even though they are pink . . . )! I'm so happy you found a way to hop along with us! Too cute and I love pink, send it to me! I love the card and have another idea since I have that die. Happy Birthday to your youngest, maybe she wouldn't mind if the card was made by mom? Hugs! Cute card! Glad you could join us on the hope this month! Have a great day! Adorable card, Lisa. The background is great. Thanks for joining us! Lisa, how fun to be part of a die cutting club, I may have to check that out!!! And your cards are just super cute. I love dies too, they can create such a detailed card. Thanks for sharing. What a fun card! And I love that cutting die. 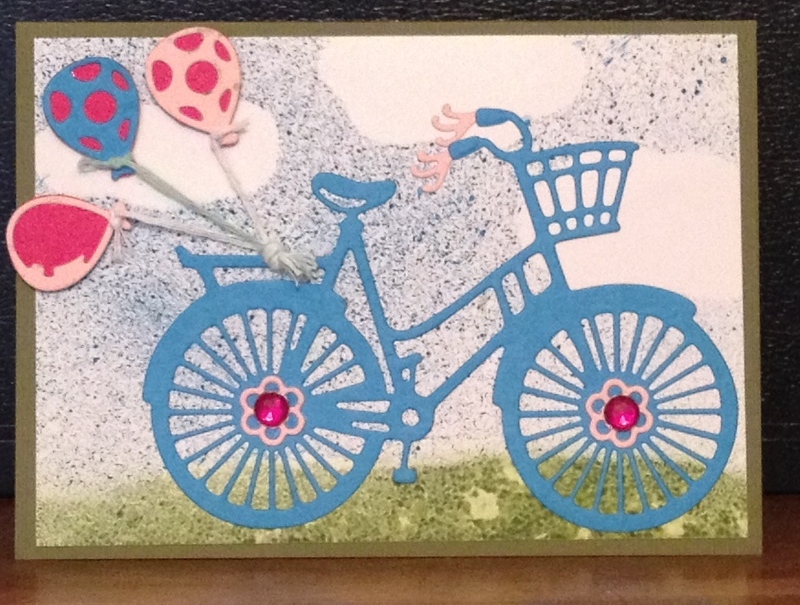 We have lotsof bikes in The netherlands,so it would be fun to make a card like yours! Yep, can't possibly get any cuter than that! A wonderful artsy cute card, just love it, thanks for sharing! Lovely Card Lisa!! I hope JT is feeling better! Very cute even with pink! Love the bicycle die. Cute card. I love the bicycle and how you made the background.